Putty is returning the following lines, does it mean that gl_health is killed and deleted completely ? What if I full reset the router, will gl_health be restored again ? Can’t seem to be able to connect to any network using Luci. From the Slate interface it works well, I dont know if its only me not knowing exactly how to use Luci. Judging only from what I am experiencing right now using the Travelmate service, this feature is A MUST HAVE on the Slate, I would love to have it integrated into the main interface (not Luci), for me it will be always ON, or maybe we can switch it on and off directly using the hardware button. Do I still have to first manually connect to network in the GL GUI (>Internet)? - seems answer is yes. Do I need to disable auto scan and reconnect under repeater options in the GL UI? - I would think yes if Travelmate is enabled. And does this setting become redundant anyway if GL Health has been deleted? Do I need to save the station(s) in GL UI? Why would we need to install an additional package (travelmate)? WiFi repeating works fine on the ar-300m and it’s supposed to be a feature in the ar-750s. Surely it should work without having to mess around with installing anything? It’s an advertised feature that doesn’t work. It needs to be fixed in the stock firmware. On the firmware I am using this option isn’t available (009) only (013) has it, so I don’t know if turning it on or off will make a difference. 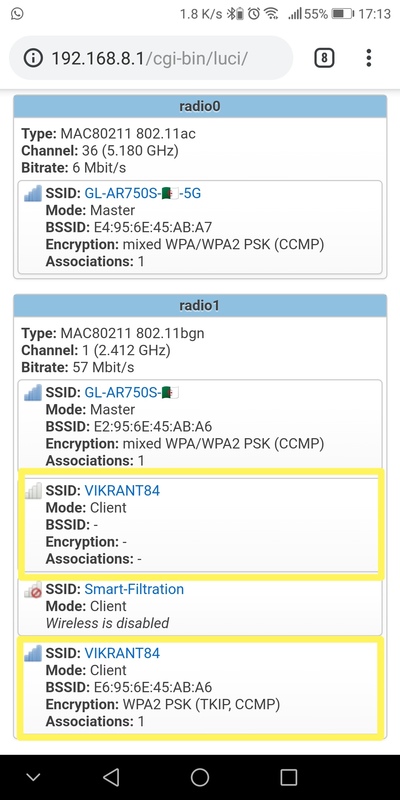 I saved it, when you logging Luci you will see two same SSID, one active and the other one is not. Well, we are getting there, @wellnw promised to fix the firmware and to integrate travelmate into the it, it’s been more than 3 months (since December) the slate didn’t receive any release update, maybe we will have a very good one soon, fingers crossed. Thank god, I’ve been having this issue for months. Please @ceruleancerise if you tried it, report back if it is working fine for you or not, so the devs can decide to include this feature in the next stable firmware. For me, it’s working marvelous right now, and I am still testing this router, it’s working h24, had only few disconnections but it reconnect quickly by itself. Actually we don’t want to integrate travelmate into firmware by default. We are optimizing the gl_health now, which has worked for several years, it just has some bugs in v3.013. @wellnw said that this feature might be integrated into the next release. Also, neither firmware 009 nor 013 was stable for me, both with random disconnections and overall unusable. This travelmate fixed my issue, and I hope it will help others, their feedback will decide whether travelmate is compulsory or not on the the Slate. Sorry for the mistake. We will refer to its implement, but won’t integrate it into our firmware, we are optimizing the gl_health, I think the gl_health will work better than travelmate, even though it has bug since v3.009. We try us best to make it better. You can test it in portal environment, such as airport, the travelmate also won’t work well. Then you are a prime candidate to try Travelmate - test and kindly report back. I am testing / using Travelmate too.- my AR750S would also drop connections and reboot regularly until I made several tweaks to my set-up and finally switched from 2.4Ghz repeater mode to 5 Ghz (which seems to be pretty stable). Now, for testing purposes, I switched back to 2.4 Ghz and installed Travelmate - so far, so good - much more reliable than GL Health. @sos_sifou @glitch I am also testing travelmate these few days, and I found that in some cases it doesn’t work very well. So we decided to still use gl-health, we will refer to the processing mechanism of travelmate. Just bought a new AR750s. Was quite happy before I gave it a try. Repeating from 2.4g to 5G in the same room is disaster. Keeps disconnecting reconnecting every minute or so. Based on what I have read on this forum I renamed gl_health directory to disable it. rebooted. Yes repeated disconnections and connections stopped. I lived about 10 minutes and disconnected forever. Tried to install 3.0013 and issues are the same. Please help. Why did I purchase this? If it cannot keep up with straight routing from 2.4 to 5.g (even turned off 2.4 output) how do I trust more complex functions? Something is leaking from a process and makes it unstable and then gl_healtcheck reboots. Watchdog like that is ok, every couple of days is fine… Every minue is not acceptable. Please review all memory leaks and buffer overflows that may cause instability. note: also firmware upgrade button from safari on macos does not work, only firefox works. Never mind on that. Bu if you have time, fix that as well. Also, slight screechng noise comes depending on traffic from router. Sounds cool but that corresponds to bad capacitors. Probably short lifespan too. Beware. My tests lead me to the conclusion that it is not usable “out of the box” trying to connect to your ISP router as a repeater under 2.4 Ghz. On the other hand, 5 Ghz seems pretty stable. I disabled GL Health and tried Travelmate which seemed pretty good but alas, when I updated to try a testing version of the VPN policy routing firmware, Travelmate and it’s settings were gone! As I have said numerous times, I do not understand why this model does not work using 2.4Ghz because the AR300M I replaced it with was almost bombproof. Update: After 30 minutes both 2.4 and 5g SSID’s disappeared by themselves and I am defaulted to ISP wireless router. Will power cycle to see what happens. Young generation programmers are careless. I am a professor in computer engineering. Just by testing, you cannot improve a bad written code. Fixes introduce more errors. You need to start with clean head and calm attitude. Should give it a time before adding up more features. I urge the management of GL.inet to let programmers do their work with calm programming. Tell them to think twice for everything. Because after they make errors, its too expensive to find it.